Take control of your Listings! 73% of people lose trust in a brand when their listings are incorrect. The review side of your brand and reputation is just one of several important aspects that can factor into the overall online health of your business. Having a process to help ensure that your companies information, everything from the correct business name, phone number and address along with the all important website URL. 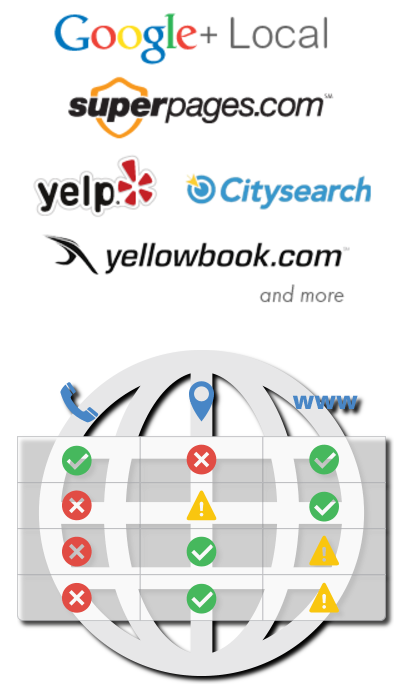 As basic a concept as it may seem to make sure all of your internet listings are accurate and uniform, achieving this is no easy task for a business owner. Business listings across the web often contain small but very important informational errors. Once an error, no matter how small is indexed on one website it can easily find itself published on several properties. This can cause frustration to you and the consumer. Could there be anything worse than a customer ready to do business, only to call a wrong or disconnect number? Maybe it’s a bad website address or they are finding an old location that you moved from long ago. Scenarios like these happen every day and there is a good chance it could well be happening to your business. Reputation Lobby & your business listings! of all information begins and ends with the four major data providers: Factual, Acxiom, Infogroup and Neustar (Localeze). days or weeks you spend trying to correct the data manually because the incorrect business information will continue to publish all across the web. identifying what still needs work as well as making sure updated information well stays updated. How long does it take for updates? Knowledge is power. Let Reputation Lobby power your listings. Just need to finish ordering?